Men’s grooming has seen a significant uptick in the past five to 10 years, and for stylists who have tapped into the male market this is a big win. But with society increasingly encouraging and accepting well-coiffed men, colorists can get in on the men’s hair-color game. There’s an opportunity to increase the value of your men’s service with gray reduction or camouflage, bold all-over color, fashion color or something in between and to up your income as well. “We are long past the days of Sun-In and peroxide,” says Rob Diaz, Esquire Grooming artist. Begin your service as you would any other—with a solid consultation. Listen to what your client is saying, and offer color options along with cut. If he’s receptive to the idea, take it from there. 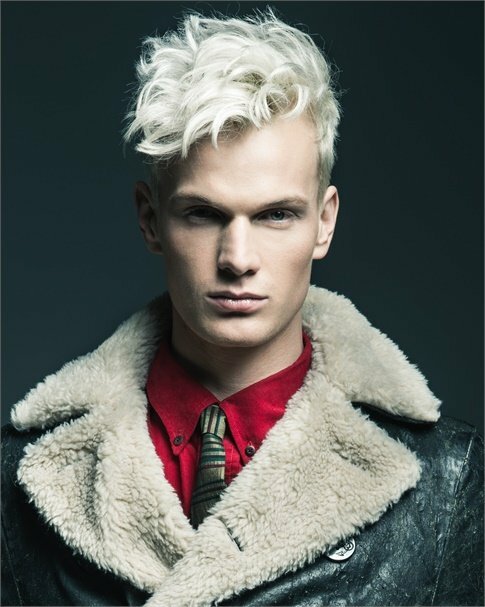 “Men are looking to us as experts to help achieve the look they want and suits their face and lifestyle, so color is the tool to help change their look,” says NAHA Men’s winner and Schwarzkopf Professional Essential Looks Artist Paul Pereira. Probably the most common color service for men is gray reduction or camouflage. Anti-aging beauty solutions are a trend that will never go out of style. “Gray hair looks great on a lot of men, but for male clients who are looking washedout or dull with their natural tone, I often recommend a demi-permanent color, as it can help blend the non-pigmented hair without looking too unnatural,” Valerie says. Diaz says it’s all about getting to know your client so you can see exactly what they want. Even with someone who gets the exact same cut every time, bringing up color is a way you can try to shake them loose from routine and exceed their expectations for the end result. If new growth is a concern, be equipped with an answer and a solution. For instance, instead of coloring every gray or white hair, consider blending so it looks more natural and doesn’t create a harsh line after a few weeks of growth. “The best intro to coloring for men is to comb-in or full-application color using a wash-out color semi-permanent with the lowest peroxide level—like Schwarzkopf Vibrance,” Pereira says. Regardless, having a conversation about upkeep is important. He’s probably coming in more regularly for cuts, so the transition should be slight if there is one at all. Creative hair color has greatly increased in popularity for women (and in mainstream acceptance) in the past decade, and men also want to get in on the action. “As gender stereotypes are being blurred more these days, men are increasingly becoming more open to bolder colors, and in turn it is becoming more normal for men to also be able to express themselves through their hair,” Valerie says. Diaz says stylists are largely responsible for setting trends and letting clients know the options available to them. Just as with a female client, if you think a color service would look amazing on your male client, tell them, Pereira says. Maintenance is vital for more dramatic transformations, but you already knew that. Ensure your client also knows and re-books his next appointment while he’s checking out. Frank Gambuzza uses a razor to remove density and change the texture of the hair. "It's all about versatility and flexibility," Gambuzza, owner of Salon Visage, Knoxville, Tennessee, says. Here he shares tips and demonstrates in a short video. Getting to the root of what can cause thinning hair and how a correct consultation and real facts will lead to the best outcome. Men are welcoming styles that look best when blow-dried to create the volume, density and hold they want. But not all clients know what results are achievable with a little lesson in technique. The challenge? How to keep bobs, lobs and long layered haircuts—cuts that make our clients so happy—looking modern and interesting. Find out how cutting and styling experts are keeping things fresh this season. Men are open to hair color, but, according to salon owner, educator, platform artist, and entrepreneur Marco Pelusi, you must be the one to start the conversation. That gorgeous gruff may be well-groomed but that's not always enough to prevent odor buildup. A product from Clubman combats the dreaded beard musk. If your client is sporting some facial hair, help him keep it looking healthy and handsome with these top tips and products. Months of planning, practicing on mannequin heads, taking the perfect photos, and working with vision has paid off for select entrants of America’s Beauty Show’s (ABS) renowned international competition. MODERN met with several barbers at the Takara Belmont Barber Mixer 2019, asking the question of the day: What are the three things every barber should know. Some of the answers surprised us! One of the best days on the barbering calendar, this show has grown every year. Meet Melody Hames, aka The Horse Barber. She has changed the face of equestrian clipping—yes, that’s a thing, a HUGE thing!—with her unique artistic approach and graphic detailing when she cuts horse hair. Here, we take a look at some of her incredible designs.